FB is in the news again for listening to you and then doing ads for it. FB is denying it but people are posting evidence like this. Adam was talking about this on his podcast a few weeks ago. DannyFanny wrote: Adam was talking about this on his podcast a few weeks ago. It's mostly about cars. He was mentioning something about getting random ads after just talking about them. Facebook is getting a lot of bad press this week. Has anyone here deleted it? You can easily save all of your pictures to your PC before doing it. I am such a hypocrite about all of this. I don't like Facebook, but I love Oculus. I think it's shady what Facebook is doing with user data, but I openly welcome Google to know everything about me. Should I delete Facebook? Yes. Will I? Probably not. Would my life be in any way different? I would gain a couple hours a week and lose a way to connect with some people. The only time I EVER look at facebook is when Kathryn tells me to. Elon Musk deleted all of his company pages after a Twitter user pointed out he uses the platform. He claims he didn't know and they were gone minutes later. Facebook scraped call, text message data for years from Android phones. Snapchat is building the same kind of data-sharing API that just got Facebook into trouble. Blue Jackets wrote: Source of the post Snapchat is building the same kind of data-sharing API that just got Facebook into trouble. I don't use Snapchat, but users aren't sharing the same kind of data on this app, right? There aren't profiles? I also haven't ever seen a "share it with Snapchat" option on a website, that is how Facebook is able to track people so well. I believe Ublock Origin (chrome and Firefox) can block this stuff as well if you enable it. Blue Jackets wrote: Source of the post the company will place a link at the top of everyone’s news feed to a privacy tool. This tool will reveal whether a user’s data is embroiled in the Cambridge Analytica scandal — and it could reignite the #DeleteFacebook movement. How will Facebook tell me if my data was harvested? 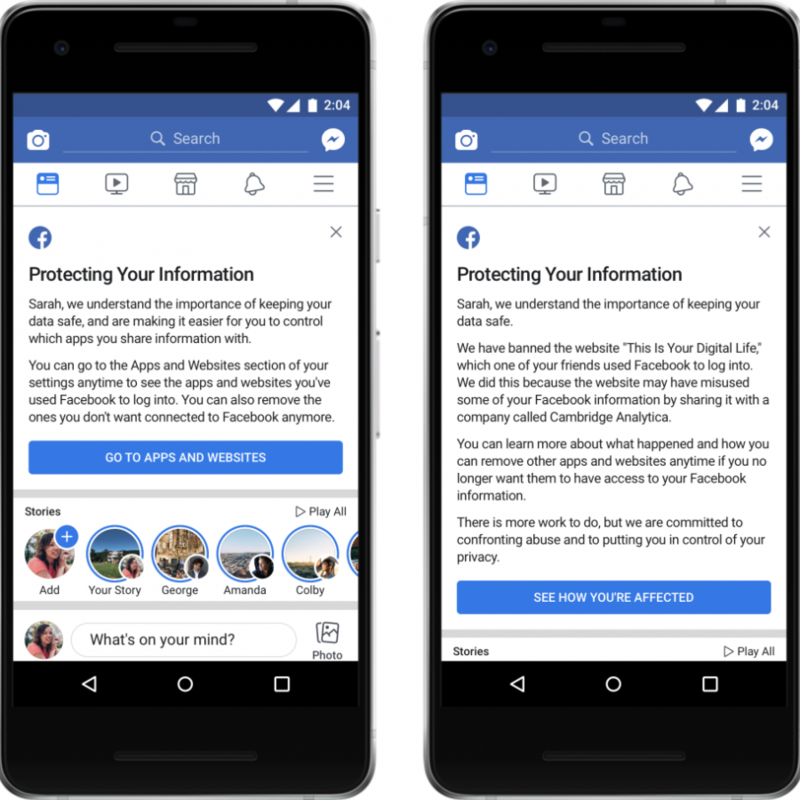 From Monday, all 2.2 billion Facebook users will receive one of two notices titled “Protecting Your Information” at the top of their news feed. This will include a link to show people the apps they use and the information they have shared with those apps. One of the notices will tell Facebook users whether their data may have been shared with Cambridge Analytica, Facebook’s chief technology officer Mike Schroepfer said in a blog post. Has anyone seen these notifications yet? 44 Percent of Americans 18-27 Have Deleted the Facebook App This Year, Poll Finds - A new study shows that young people are moving away from the Facebook app and, at the very least, are changing their privacy settings.